The Law Society Skillnet North West General Practice Update 2015 took place at Lough Eske Castle Co. Donegal. The collaboration also known as “Donegal’s cluster” was coined as a complete success by those who attended on the day. Over 100 visitors from the Law Society Skillnet and the Donegal and Inishowen Bar Associations attended the event at Lough Eske Castle. 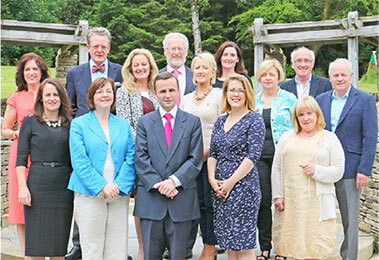 Below is a photo of the speakers at the Donegal cluster event. The speakers at the event and those in the photograph above include; Liz Pope (Property Registration Authority), Moya O’Donnell (Moya O’Donnell & Co Solicitors Donegal), Dr Geoffrey Shannon (State’s special rapporteur on child protection), Teri Kelly (director of representation and member services) and Geraldine Conaghan. McBride Conaghan Solicitors (president, Inishowen Bar Association)Michelle Nolan (Law Society Skillnet), Paul Keane (Reddy Charlton), Attracta O’Regan (head, Law Society Skillnet), Brendan Twomey (James P Sweeney & Co Solicitors), Michele O’Boyle (O’Boyle Solicitors), Colette Reid (Law Society), Margaret Mulrine (Margaret Mulrine Solicitors president, Donegal Bar Association), Michael Cunningham (O’Gorman Cunningham & Co Solicitors) and Kieran Ryan (Kelly & Ryan Solicitors & Leitrim Bar Association). Issues addressed at the event included new District Court Rules, the registration of easements, the Children and Family Relations Act, employment law and the Companies Act. Those who attended were updated on these issues by the panel of experts mentioned above. The meeting was a great opportunity for legal practicioners around the county to network. Other CPD regional cluster events will also be taking place later this year. There are events scheduled for Mayo, Monaghan, Kilkenny, Cork and Dublin. Disclaimer: * In contentious business a solicitor may not calculate fees or other charges as a percentage or proportion of any award or settlement.